2. All of your bookings will appear on this page, whether they are confirmed, pending, or cancelled. To view any of these appointments, hover over the grey “Manage” button on the right-hand side of the page. A small menu will appear; click on the “View” option. 3. From here, you will be able to view all details about the appointment. 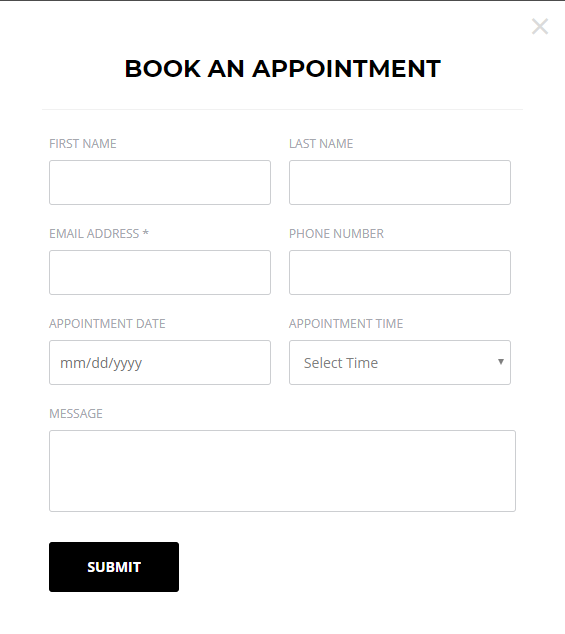 This screen will display the client’s contact information and the appointment date/time. There are other actions you can perform on this page, but we will go through those later. 1. First, navigate to the “Booking” section on the left-hand side of the dashboard. 2. Once on the bookings page, hover over the grey “Manage” button on the right-hand side. A few options will appear once you hover over the button and you’ll want to click on the “Cancel” option. 3. After clicking “Cancel,” this screen will appear. To confirm the cancellation, click on the blue “Yes” button. 2. Once on this page, hover over the grey “Manage” button on the right-hand side and click on the “Reschedule” option that appears. 3.After clicking on “Reschedule,” the screen pictured below will appear, which will allow you to choose a new appointment time and date. Once you have changed everything you want, click on the blue “Save” button. 2. 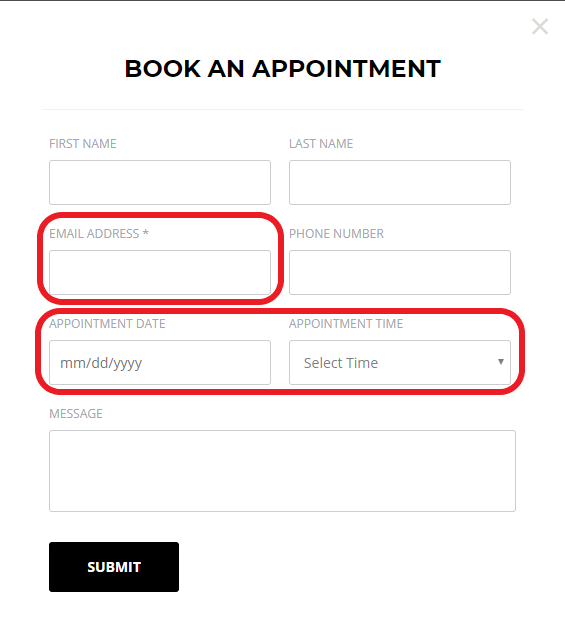 There are two ways to contact your clients through booking. The first and easiest is by clicking on either the email or SMS icon under the “Contact Details” column. 3. The second way to contact clients is by hovering over the grey “Manage” button and clicking on “View” from the drop-down menu that appears. 4. You will then be brought to the page below. On the right-hand side of the page, under “Account Information,” the client’s email address and phone number will be shown. Next to both, there will be blue icons which will allow you to message the client. 5. Once you choose to send an email or a text message, this screen that allows you to create the message will pop up. Once you’ve created the message, then you can click on the blue “Send” button. 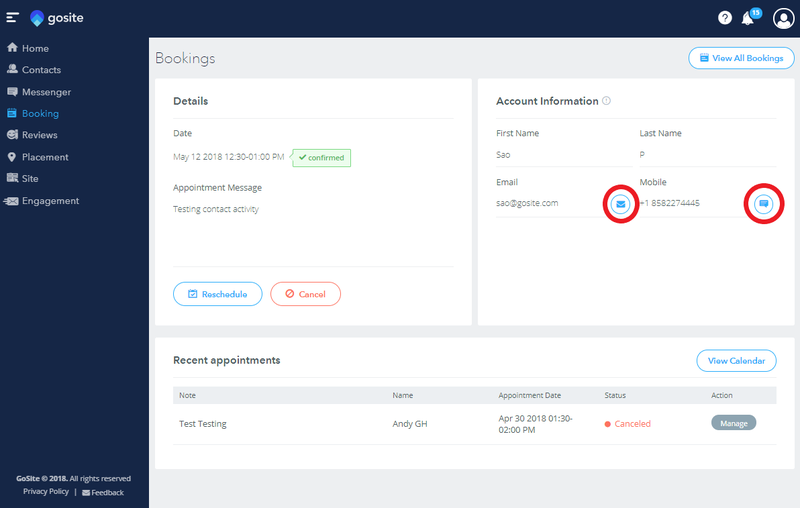 If you'd like to see a video walkthrough of how to add a booking, click below!